Ben Pugh's Farmdrop aims to help producers take back the power from supermarkets. The hard-fought supermarket price war has claimed many victims, not least the suppliers who are often squeezed to the limit. Many small food producers have felt powerless to push back. Ben Pugh’s Farmdrop wants to change that. The company aims to aims to cut out the middle man – customers order online as they would with a supermarket shop and prices are broadly comparable too, but the orders go directly to producers. Pugh developed the idea for the business as ‘a disgruntled customer’ back in 2012, when he was living a busy life in London and struggling to get hold of fresh local produce. 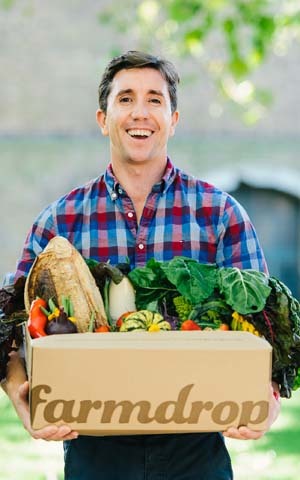 Farmdrop started with a click and collect model which involved an extra person, dubbed the ‘keeper’ who orchestrated the pickups, but it now delivers direct to customers’ homes. Before, producers took 80%, Farmdrop 10% and the keepers 10%, but now it’s a 75/25 split, still weighted towards the producers. ‘The cost of that home delivery model means that to be a sustainable and profitable business we (only) need to retain 25% of the retail price,’ Pugh tells MT. Producers would ‘be lucky to get around 40% from other conventional marketing channels’ he adds, which would mean the financial return from Farmdrop is about twice as good. Pugh won’t be drawn on the firm’s most recent turnover figures, but he says revenue has gone up by an average of 230% each year. 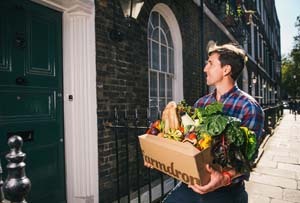 And it’s been winning over investors as well as customers – Farmdrop recently secured £3m in a funding round led by Skype founder Niklas Zennström’s investment firm Atomico. Now customers can buy from over 50 producers, and Pugh says there are constantly new ones being added to the site. ‘When I first started – I cringe when I think about it now – it was veg boxes only,’ he explains. ‘I was so obsessed with fixing things from the producers’ side that I think I forgot about the importance of trying to solve consumers’ problems, and really that’s all you can afford to do think about in food retail.’ The range now covers eggs, meat, dairy and yes, vegetables aplenty. Still, there’s a reason supermarkets are the go-to option for many people and it’s not just because they don’t know any better. Farmdrop has a way to go before it’s biting a huge chunk out of the market - and it has plenty of competition from the likes of Abel & Cole too. It currently only delivers to London, but Pugh’s plans are to go UK-wide next year, while bringing on board new software engineers and product managers to bolster the 18-strong team. Will your industry survive in the changing economy?